Utes will try to extend the best three-game stretch of their Pac-12 era Friday at UCLA. (Trent Nelson | The Salt Lake Tribune) Utah Utes quarterback Tyler Huntley (1) scores a touchdown as the Utah Utes host the USC Trojans, NCAA football at Rice-Eccles Stadium in Salt Lake City, Saturday Oct. 20, 2018. Now that that Utah's football team has responded remarkably well after a slow start of the conference season, the question becomes whether the Utes can do something they've never done in the program's Pac-12 era: finish the season properly. The Utes' 41-28 victory over USC last Saturday lifted them into a first-place tie with the Trojans in the Pac-12 South. Statistical models and USC’s depleted state make Utah the favorite to win the division title, assuming the Utes can overcome their history of fading in November. Going into Friday’s game at UCLA, the Utes have staged one of the best Octobers in school history, scoring 40-plus points in beating Stanford, Arizona and USC. In essence, the calendar already has turned to November. The Utes (5-2, 3-2) are down to their last four Pac-12 games, with the new variable of having a nonconference opponent (BYU) in their regular-season finale. Utah’s performance Saturday impressed AP Top 25 voters, Pac-12 observers and ESPN’s Football Power Index formula. The No. 23 Utes are ranked for a fifth straight season and quarterback Tyler Huntley (offense), linebacker Chase Hansen (defense) and kicker Matt Gay (special teams) gave Utah the fourth sweep of individual weekly awards in Pac-12 history. 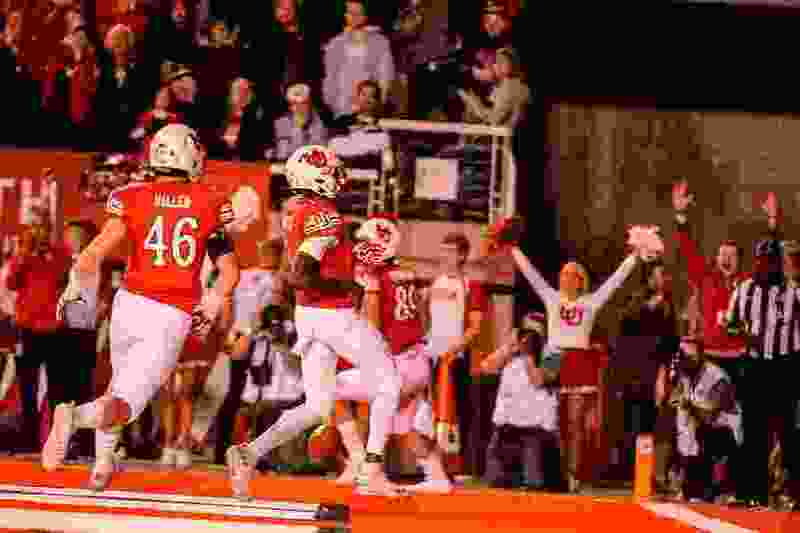 The Utes have two things going for them in their bid for a South title. Utah's offense, judging by a 541-yard effort vs. USC, is unlike anything the program has fielded in the Pac-12 era. And the resilience the Utes showed in coming back from an 0-2 start in league play and a 14-0 deficit in Saturday's first quarter suggests they can keep performing well, even if maintaining the current level of play is asking a lot. Whittingham’s teams have fallen short in this decade, having gone into November with four good opportunities to win the South. The 2011 team lost 17-14 at home to Colorado, on a day when other outcomes converged in Utah’s favor (and USC was ineligible for the title). In 2014, Utah could have tied eventual champion Arizona in the standings, but lost 42-10 to the Wildcats at home. In 2015, the Utes stood 5-1 in Pac-12 play, and a 7-2 record would have won the title outright. But they lost 37-30 at Arizona in double overtime and then fell 17-9 to UCLA. And in 2016, a 30-28 home loss to Oregon prevented Utah from creating a true division-title game at Colorado. The Utes face a more demanding schedule than USC but they own the tiebreaker, so they just have to match the Trojans' record in the remaining four conference games. The asterisk is a team such as Arizona State or even UCLA could make a push by beating both Utah and USC, and Colorado is not out of the picture. While allowing for strange occurrences, Utah likely needs to win three of the next four games to earn a berth in the Pac-12 championship game, Nov. 30 at Santa Clara, Calif. The way USC played Saturday, the Trojans hardly appear capable of winning four straight games. ESPN’s Football Power Index gives Utah no worse than a 65-percent chance of winning any of its remaining conference games. The way probability works, though, the Utes have only a 25-percent chance of winning all four games. The FPI assigns similar numbers to USC, without any judgments about personnel. Utah is preparing to face either of two UCLA quarterbacks Friday, with freshman Dorian Thompson-Robinson having left Saturday’s 31-30 win over Arizona due to injury. Wilton Speight, a graduate transfer from Michigan (he dressed, but didn’t play against Utah as a freshman in 2015), was the Bruins' original starter this season. Speight is not a dynamic runner like Thompson-Robinson, but he completed 17 of 24 passes for 202 yards and two touchdowns against Arizona. As for the current recruiting cycle, Whittingham was thrilled with Saturday’s atmosphere at Rice-Eccles Stadium and the impression his team’s performance made on an important group of prospects visiting the campus. Utah (3-2) – at UCLA (75.6%), at Arizona State (65.7%), Oregon (72.3%), Colorado (69.5%). Chance of winning out: 25.0%. USC (3-2) – Arizona State (63.2%), at Oregon State (91.0%), California (74.5%), at UCLA (60.9%). Chance of winning out: 27.7%. Colorado (2-2) – Oregon State (93.8%), at Arizona (52.0%), Washington State (41.2%), Utah (30.5%), at California (47.6%). Chance of winning out: 2.9%. Arizona State (1-3) – at USC (36.8%), Utah (34.3%), UCLA (70.1%), at Oregon (30.4%), at Arizona (57.9%). Chance of winning out: 1.5%. Arizona (2-3) – Oregon (35.2%), Colorado (48.0%), at Washington State (18.4%), Arizona State (42.1%). Chance of winning out: 1.3%. UCLA (2-2) – Utah (24.4%), at Oregon (21.6%), at Arizona State (29.9%), USC (39.1%), Stanford (28.6%). Chance of winning out: 0.2%.